Climb Aboard for Some Great Red Bus Bingo! A lot of thought has gone into the development of the Red Bus website. The transport theme runs through every aspect of it, from the promotions to the banking, which gives the whole set-up a bit of a quirky feel. Although the tone might be playful, the site is serious about its offerings. The bingo sessions are held regularly, and cover all kinds of jackpots. There is a selection of casino games on offer too, with slots, scratch cards and live dealer version all listed. Members are provided with regular promotions, as well as the chance to join a great loyalty scheme. You’ll even receive a bonus when you first join to get you started on your journey! It’s very easy to sign up with the website, as you just need to fill in your information on the online form. This is basically asking for your name, address, email, and phone number. Once it has been completed, you’ll be sent a text with a verification code on it. Simply input the code in the boxes on the site, and your registration will be complete. A welcome message should now appear on the screen as confirmation of your membership, and you are now officially a new passenger! Red Bus Bingo accepts members from the majority of countries. There are only a few exceptions due to licensing restrictions and unfortunately, one of these is the US. The minimum deposit at Red Bus is set at £10, and the very first time you add this sum to your account, you’ll receive your travel card. In reality, this is a £25 bonus, which means that you’ll actually have £35 to play with. There are some wagering conditions attached to this offer, and you’ll be required to wager two times the total amount before you can make any withdrawals. This offer only applies to bingo, and it cannot be converted into real cash any winnings that you might accrue as a result of the welcome promotion will be added to your playing funds. Three days of Freebies for New Members! New members – or passengers as they are referred to on the site – get a free pass for the first three days of your membership at Red Bus. This gives you the opportunity to tour around the website, and to see exactly what it’s all about. Your first destination should be the hour jackpot game, which is especially for the newest arrivals. This is the 75-ball version, and it is held every hour from 7am until 10 pm. Once you’ve settled in, you’ll be able to take part in a 90-ball session every ten minutes, at various two-hour periods throughout the day. Additionally, if you have deposited funds to your account in the last three days, you’ll have the chance to win £10 in a special round of bingo. If you take part in any of these deals, you’ll be allocated six tickets, and the standard 2x wagering requirement will be applied. Get your £30 + 40 Free Spins at RedBus Bingo today! There are a number of other promotions that you might want to explore once you’ve become a full member. There are the weekly rides, with different offers every day. Every month, there is the chance to win £1,000, with tickets beginning at just 10p. The session is held at 9pm on the last Friday of every month, and there are payouts for players who complete one or two lines, as well. There’s also the Daily Unwind, which is a shared game, and so members from the sister sites can take part in it, too. This is a real benefit because the game has a progressive jackpot, and more participants naturally equates to a bigger prize fund! It begins at 4pm every day, and finishes just before midnight. Whenever you make a £10 deposit using the special code, you’ll be entitled to a go on the Wheel of Wins. VIP members get to spin their own version of this, with even more rewards on offer. The wheel has an array of treats around it, which include bingo tickets and a whole host of additional bonuses. 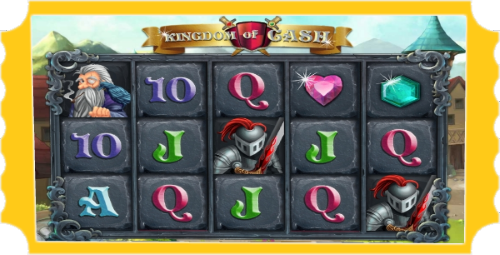 You could also be awarded with some free play on one of the slots, and the titles for this part of the promotion are White Wizard Deluxe, Stampede, Gems Odyssey, and Kingdom of Cash. Each of the incentive has different terms attached to it, so be sure to read the terms and conditions carefully. It isn’t actually necessary to download anything, even if you want to use your mobile to access the website. Once you’ve registered and logged in, you just have to click on the play now tab, and you’ll be directed to the games lobby. If you have an iOS device that’s 8.0 or over, however, there’s a native app available, and this is useful for those times that your internet connection isn’t overly stable. This is compatible with, and can be found in the Apple Store. If you decide upon this option, you’ll still have all the standard facilities open to you, including the full range of promotions. 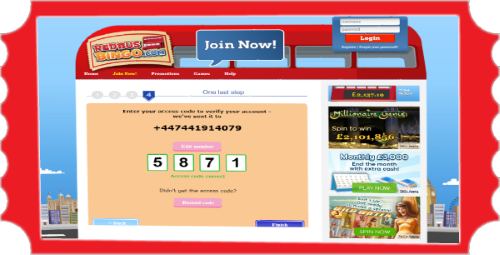 There are three different kinds of bingo on offer on the website. The first is the one that’s most commonly found in the US. This 75-ball version consists of 25 squares, which are arranged as 5 horizontal and vertical lines, with the centre marked as free. The second is the UK favourite, which is played with 90 balls. The grid for this contains 15 randomly-selected numbers. These are spread out across a grid that has three horizontal lines, and there are five numbers on each one. The final option is the Swedish 5-line variant. Although this looks like the 75-ball game, there is a number in the central spot on the card, and 90 balls are used during play. 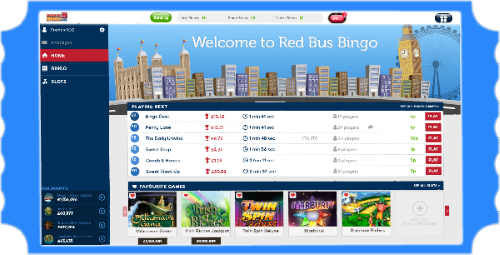 Redbus Bingo has a number of progressive jackpot games, with two that are particularly in keeping with the London theme on the website. The prize fund in Double Decker can be won in any of the 90-ball games, and is awarded to players who get a full house in fewer than 35 calls. The amount on offer for this starts at £100, and continues to grow until it has been won. The other version is called London Eye, and is played with 75 balls. This is won on calls under 41. There are several more available on the website too, including the 5 line variant. While you’re waiting for the next session of bingo to start, you can take advantage of some of the other offerings on the website. Red Bus Bingo is part of the Cassava Enterprises Group, but the slots on the site aren’t limited by this. There are titles from other leading providers, including NetEnt, SG Interactive, and Pragmatic Play. You’ll also be able to participate in two of the slots games with big jackpots, with top titles such as Millionaire Genie and Gods of Gold on offer. If table games are more to your liking, there’s a range of them available in the casino section. You can choose between Baccarat, Keno, and Deuces Wild, or go for Caribbean Poker, with its big jackpot. You’ll have the chance to pick up one of the instant wins too, as there are lots of scratch cards listed. There are two NetEnt slots on the website that have shared jackpots. This means that they are open to players from other sites as well, who will all be able to wager alongside members of Red Bus Bingo. As you can imagine, this greatly boost the overall prize fund. The first of these titles is Hall of Gods. This game has a Nordic theme, and you’ll be trying to defeat the evil dragon with the assistance of notorious deities, like Loki and Odin. The second is Mega Fortune. In this, you’ll be in luxurious surroundings, and symbols on the reels include champagne and diamond rings. Each of these progressives has three levels, and there’s big money on offer in them all! If you like to watch the action taking place in real time, you’ll be pleased to know that there are some live dealer games available at Red Bus Bingo. The website carries Evolution Gaming’s Dream Catcher, which has already proven to be very popular with both slots and bingo players. 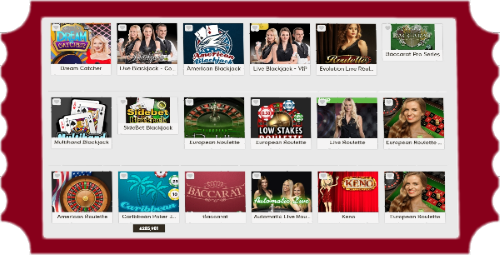 The Blackjack offerings are provided by NetEnt, and there is a separate listing for VIP members. You can also go for one of the European Roulette options. You’ll find the automatic version among the selection. Although the play is still happening as you watch, there isn’t an actual person for you to engage with in this variant. Instead, there will be a voice over, so you can follow proceedings. 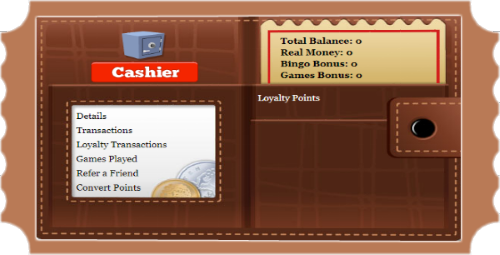 The website runs the standard type of loyalty program, which awards you a number of points every time you play. When you have collected 1,000, these are converted in £1 for you to spend on bingo. Additional points can be won during the Happy Hour on the site, which is between 6 & 7pm every day, or in one of the extra games that take place in the chat rooms. You’ll also be given 15,000 points if you refer a friend to the site. Interestingly, there is an alternative loyalty scheme being run on the site in conjunction with the usual one. This has been launched as a trial version, and is called My Red Bus. When you participate in this option, you’ll have the opportunity to win some benefits by completing a set of personal challenges. Once you’ve completed the allocated tasks, you’ll be awarded with a virtual trophy or another kind of treat, which you can claim from the prize store. The VIP scheme is part of the Joy Gem Club. 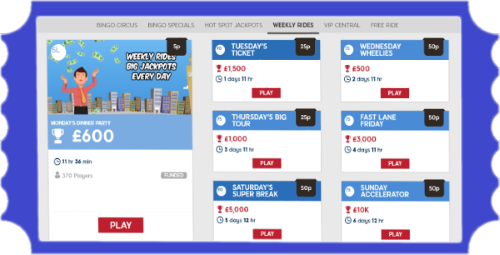 Once you have become a member at Red Bus Bingo or at any of the sister sites, you will be entitled to take advantage of the bonuses and premium gifts that are on offer there. The best part is that once you’ve reached a level with one of the websites, you’ll be on that tier if you join another one. You’ll join the program as a Sapphire player, and as you move through the tiers, you will be entitled to a series of additional benefits. These include some exclusive bingo sessions, special competitions, and extra promotional deals. The top rank is Black Diamond, and with this achievement, you’ll be entitled to take part in some of the events on offer, such as concerts and city breaks. You’ll also have a designated chat room and an account manager, who will look after your needs. When you’re ready to make a deposit, there are several ways for you to do so. It is possible for you to call one of the support agents, who will take care of the transaction for you. This is a free phone number, even for members who are outside of the UK. 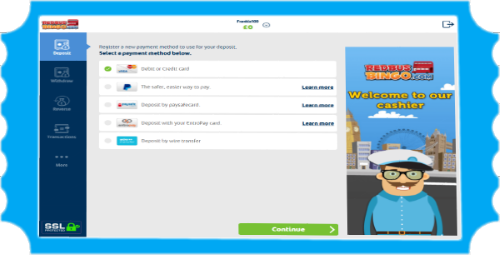 The site accepts both MasterCard and Visa, although it is stated that the latter is preferred. There is also the option of EntroPay, the virtual visa card. The ewallet possibilities are Neteller and PayPal, or you could make a bank transfer, if this is more convenient for you. In all cases, the minimum deposit is £10, and your funds will be in your account immediately, with the exception of a bank wire, which will take between 5-8 business days to be processed. The procedures for making withdrawals is a little bit different. If you are in the UK, you’ll be able to use either Neteller or MasterCard, but players based elsewhere will not have these options open to them. Visa is a possibility, although EntroPay isn’t. There is also PayPal or a wire transfer. The times for processing differs with each of the options. It can be anything from 3–7 working days for the majority of the methods listed, but it may take up to ten days before your funds are cleared if you decide upon a bank wire. In all cases, the minimum sum you can take out is £10. There are a number of ways of getting in touch with someone if you have a problem or need some further information. All of the bingo rooms have a chat manager, so you can always pose your questions there. Alternatively, you’ll be able to call the support line, which is manned from 9am until 1am. It is free from all landlines, but you will be charged a fee if you use a mobile, or if you’re outside the UK. You will also be able to contact the help team via email. The other possibility is the live chat facility, which is on the website. You just need to click on the link and one of the agents will respond. Red Bus Bingo is a part of Cassava Enterprises, and as such, it is licensed by the Government of Gibraltar. 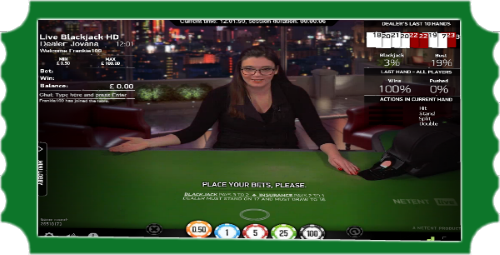 All of the games, with the exception of the live dealer version, use random number generators, and the whole system is tested routinely to ensure that play is fair. Additionally, the company has a number of measures in place to ensure that players remain protected while they are playing on the site. All personal information and payment details are encrypted by SSL technology, so that nothing can be hacked. There are a few responsible gaming policies in place, too. These include the option to set a time reminder, so that you don’t get lost in your gaming, and the possibility of using autoplay to put a limit on your wagering. You can also request a take-a-break period, if you feel you need some help, and once this has been activated, you won’t be allowed to sign into your account for a while. Finishing the Tour of Red Bus Bingo! 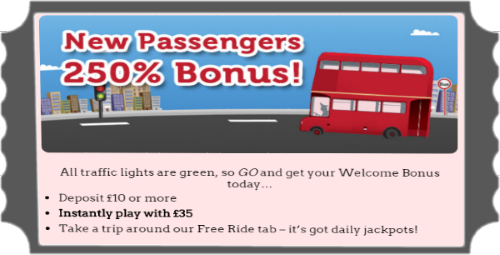 There is a light-hearted transport theme running through the Red Bus Bingo website, and a great deal of attention has been paid to retaining this fun theme throughout. Nevertheless, this is the read deal, with a great selection of bingo sessions on offer, plus a whole range of casino games available. Moreover, you’ll be welcomed with a bonus when you first enrol, and after that, you can make the most of the fabulous range of daily promotions. It’s really easy to get involved. You just need to buy a ticket, and hop on the bus!